NABET-CWA members of WKYC and Executive Officers of Local 42 conducted a successful mobilization effort of informational picketing in front of Halleen KIA on Saturday, 1-8-11. The weather was awful – cold, snow, wind and single digit wind chills. It was bitter but eleven members showed up with signs and handbills to demonstrate our disappointment with Halleen KIA’s continued advertising support of WKYC-TV, and our displeasure with WKYC and Gannett Corporation’s continued cavalier treatment and total financial disregard of their employees, union and non-union alike. Despite the terrible conditions, everyone stayed the course and we made our point. We were helped in our endeavor by none other than Halleen management. After coming outside to berate and insult us, one of their managers went back inside and began activating the security alarms on vehicles in the lot. If the plan was to irritate us into leaving, it didn’t work. The flashing lights and blaring horns only drew more public attention to our presence and message. 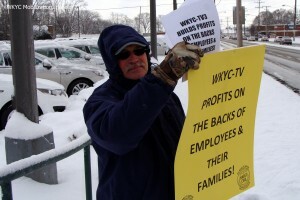 NABET-CWA and the union members of WKYC-TV do not plan on going away. We will to continue to embarrass WKYC management and Gannett, to foster legislative assistance for our cause, to pursue every legal remedy at our disposal, and to bring national attention to the regressive business practices of Gannett at all their properties. Gannett has heaped enough misery on their employees and we are not going to take it anymore. We are fighting back and joining nationwide with other Gannett employees in this just struggle. Thanks to all the WKYC members who had the intestinal fortitude to come out in personal support of a just cause, and to all the public passing by honking their horns and giving us a thumbs up. This entry was posted in WKYC and tagged Mobilization, WKYC. Bookmark the permalink.